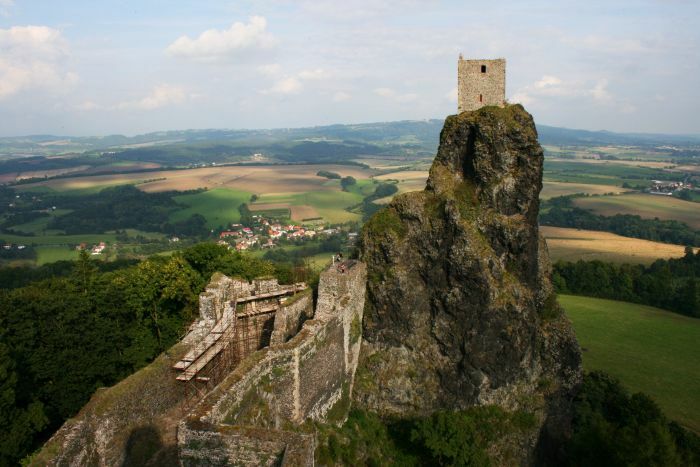 Small country in the heart of Europe is a medieval pearl. Famous for its history as well as its nature, presents one of the best places where you can travel with your dog. Not to mention that it's also 11th most peaceful country in the word with second highest number of pets in Europe. If you go by car no one will probably check you at the border, but all dogs should either be secured in the car trunk or buckled up on the back seat. The Czech Republic is a member of the European Union, therefore the law is similar as in other EU countries — all dogs need Pet Passport, pet microchip implanted by veterinarian and rabies vaccination. Detailed information can be found at PetTravel.com. 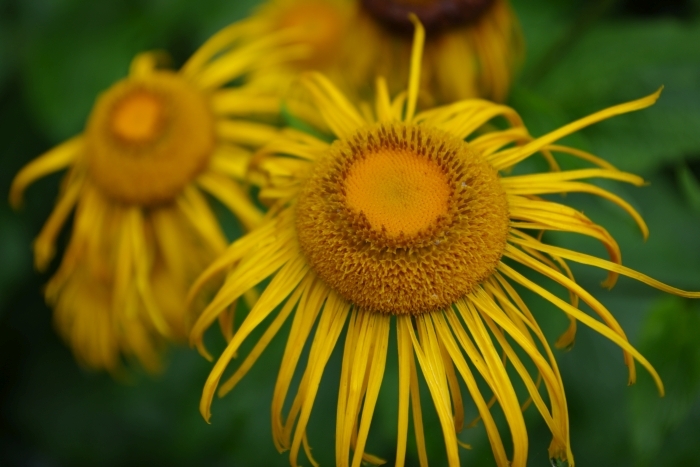 During summer I strongly recommend protection against ticks. If you fly, Czech Airlines among other carriers accept pets. You usually need a Pet Passport and an IATA certified dog crate, but you should check with your airline for instructions and further details. Most long-distance buses do not accept dogs on board (except for guide dogs) unfortunatelly. Far better choice is to use trains, but don't forget to check for enough time during transfers so that your dog can spend some time off trains stretching paws. Dog are usually not allowed in sleeping cars, you should ask the company you travel with. I strongly recommend to buy the dog's ticket at the local railway office or directly on board from the conductor, since international tickets for dogs can be extremely expensive compared to local prices. Trains are good for traveling with your dog in general — after initial familiarization, they are calm, spacey and rather monotonous. However, for me the best way to travel with my dog is by our own car, since you can always decide yourself when to stop and take a walk. Just keep in mind that dogs can never be left alone inside a car during a summer day. As little as five minutes of sunshine can easily make the car deadly to anyone trapped inside. Domestic train lines accept dogs (although private carriers and some EuroNight, EuroCity and InterCity trains may differ). All you need is a leash and a muzzle. Conductors usually love dogs and it is always the cheapest to buy your dog's ticket on board. You can choose to pay 15 CZK for each separate connection, or just 30 CZK for a whole day pass. In cities, all public transportation (trams, buses, subway) accept dogs on board in general. Again, you must use a leash and a muzzle. In some cities like Prague you also need a ticket for your dog, while in Liberec your pet travels for free. Buses between cities usually accept dogs as well, although Student Agency buses only accepts very small dogs that are carried in handbags. The price for your dog is usually half of what you pay for your own ticket. Dogs are welcome in Prague Zoo, although each person can only take one dog. The price is 100 CZK and they cannot go inside the pavilions with you. Fortunatelly, most animals to see are outside. 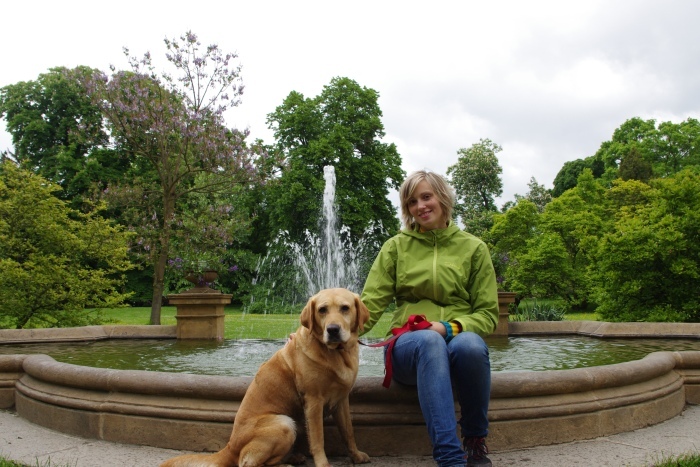 This is a question with vast variety of responses, because you can visit most of the sights in Prague with your dog. 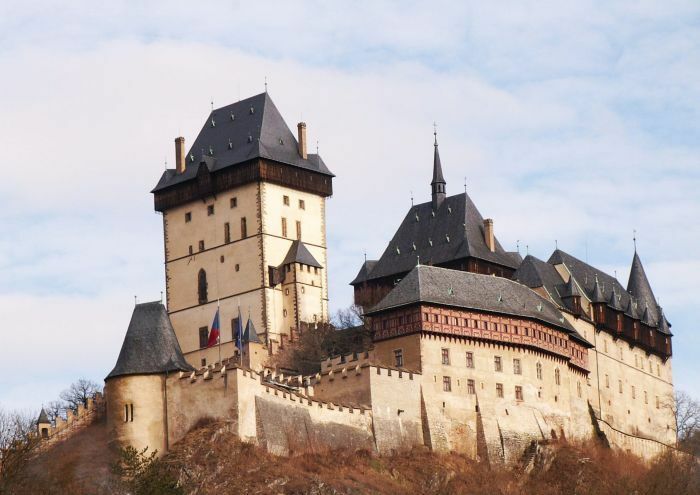 You can walk from the Powder Tower to Wenceslas Square or from the world famous Astronomical Clock to the Charles Bridge and Prague Castle with St. Vitus Cathedral which store the Bohemian Crown Jewels. In the centre you can find many parks, the most beautiful of which is Stromovka, path alongside the river Vltava or you can visit one of the best zoos in the word, Prague Zoo. They usually let you take your dog inside restaurants (front gardens outside are ideal, but inside is often okay as well). You can visit dog's bakery or cinema Aero, where dogs are welcome. 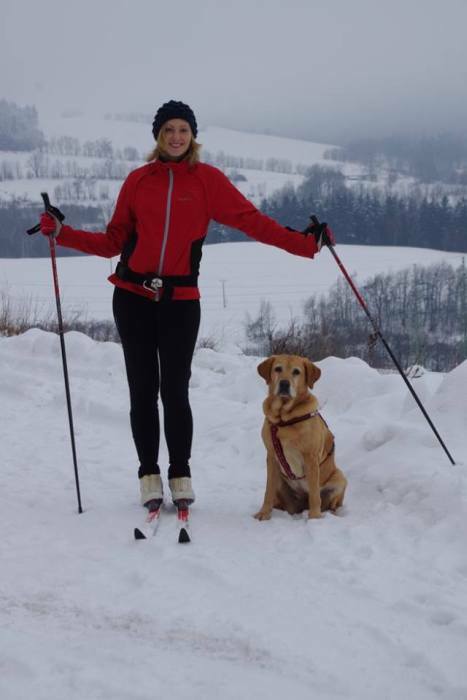 In winter, cross country skiing is a national sport in the Czech Republic and dogs love it, leash or no leash. 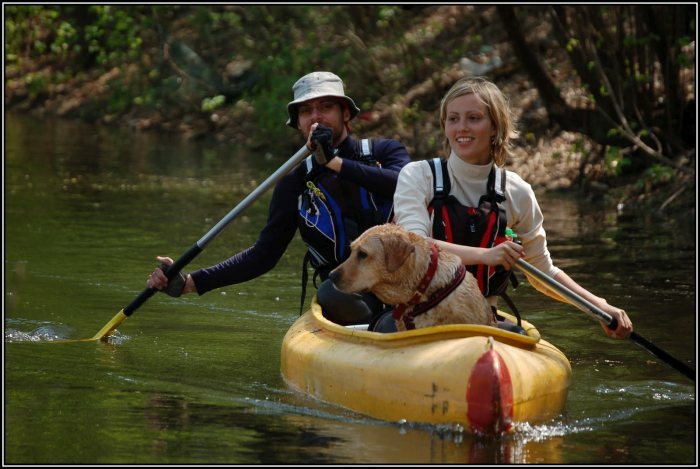 In summer lots of people enjoy canoeing and many take their dogs along, but not every river is suitable for them and you should really think it trough before you set out. Your pet friend might simply enjoy a nice hike much better than a canoe. Traditionaly popular activity is to go camping, sitting around campfires in the evening with a guitar singing, where dogs cannot be missing of course. 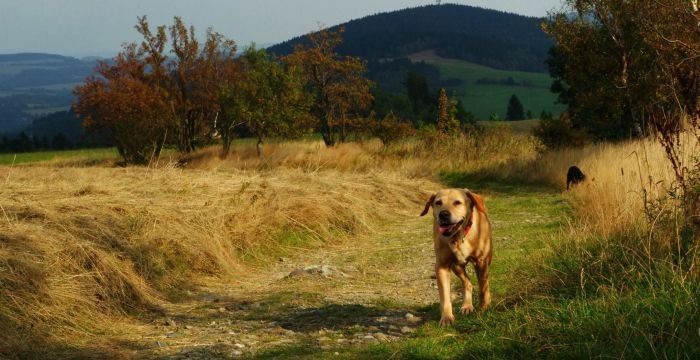 Apart from some luxury hotels, places generally accept dogs, especially in country-side and mountains. If you are tempted to live here for a while, you can easily find dog-friendly places to rent. The law forbids landlords to refuse you just because of a pet, however it's always better to ask for approval, just in case. If you are looking for roommates, the best thing to do is to search Facebook pages named "Spolubydlení", for renting flats try pages named "Pronájem". Real estate agencies can help you find something suitable perhaps, although their services are as crappy as anywhere else. 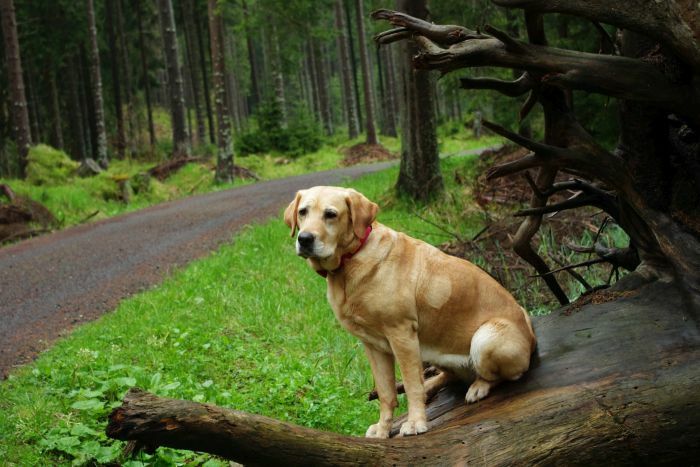 Campings grounds, cottages, chalets, huts, alpine cabins and similar all tend to accept dogs. Although it is always better to check in advance, just to be sure. You usually pay 50 CZK per dog, but some places would also take dogs free of charge. And if you want to go somewhere, where dogs are not allowed, you can always use one of the hotels for dogs; or a private dog keeper, who will keep your dog safe at his/her home with all the comfort and convenience. Most of them speak at least some English. 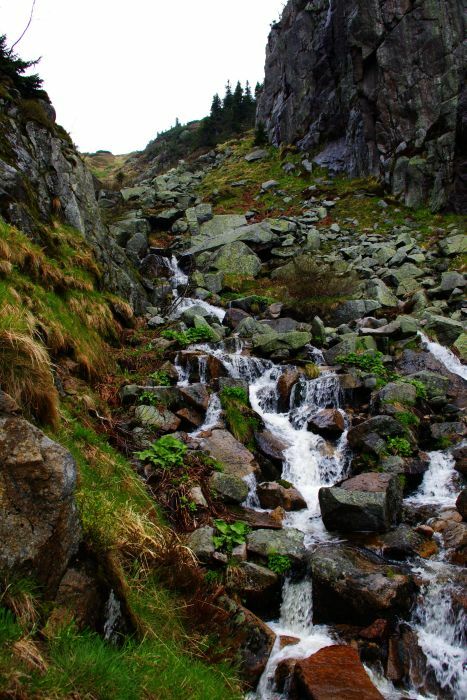 Since most mountain huts would accept dogs, it is a great opportunity to spend some quality time together with your friend in the beautiful Czech nature. Whether roaming the Giant Mountains (Krkonoše), Bohemian Forest (Šumava), or taking a lift to Ještěd, a futuristic 100-metre-tall broadcasting tower above Liberec city, dogs are always welcome. Just don't forget a muzzle, if you plan to get on a cableway or other public transport. You can take your dog to most pubs and also to some shops. They can walk down the streets and in most parks without a leash, even swim freely in ponds and lakes (unless explicitly forbidden). In forests, leash is not mandatory, but the dog must stay close to the owner at all times. Czechs don't follow the rules strictly; they rather invent ways to circumvent them. As a general consequence, there are not many rules as in others countries. 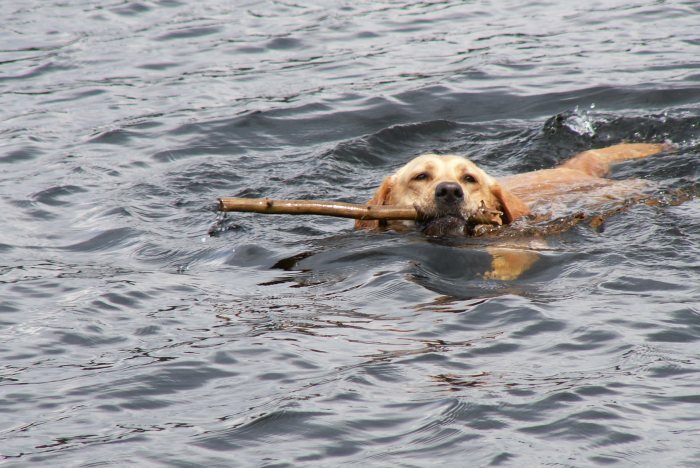 Dogs can walk without a leash almost anywhere, swim in ponds and lakes. As long as it seems safe, it is usually all right. They should not roam about though, stray dogs can get caught. In forests, you should always be able to see and call your dog away whenever necessary; chasing the wild life is forbidden in particular. You can usually take dogs to pubs, restaurants, castle ruins, on cableways or even to some shops. In city centres it is safer to take them on leash; and you must clean after your dog. Penalty for not cleaning your mess is not as high as elsewhere, but does exist. No breeds are prohibited in the Czech Republic. For more information, contact me on facebook.com/CestujiciPes or e-mail me at verca.loudova@seznam.cz. Walk the meditative mountains, swim in the sparkling lakes and run in the endless plains and golden fields, that's your dog's dream come true. Good luck!